Accumulation of debris and soot is one of the root causes of a non-functioning pilot light. It is from the tip of the pilot light that gas comes out and gets ignited. As a result soot and debris gather at the tip. Accumulation of debris can block the orifice and prevent the gas from coming out and consequently prevent ignition. You can use a brush with stiff bristles to rub the tip to take out the grit that have accumulated there. A more thorough process will be turning off the furnace and taking out the tip. Soak it in decreasing solution, such as soap and water. You should clean tip of the pilot light in every couple of month to keep it functioning normally. Sometimes the flame a furnace looks too small. Some furnaces have flame adjuster. They look like small screws. You can rotate the screw to adjust the flame. Some furnaces have instructions written on them as to in which direction the screw should be turned to increase or decrease the flame. You can adjust it according to your need. Sometimes due to jerk during a cleaning process, the knob gets accidentally turned down, resulting in a small flame. The flame of furnace should be blue in color. A yellow, faint, or irregular flame results due to dirty, clogged burner. A faulty ignition, thermonuclear problem, cracked heat exchanger, or a drafty room can also lead to pale flames. A yellow flame also indicates towards CO (carbon monoxide) leakage. Sometimes the pilot light does not ignite as there is no fuel in tank. There could also be a leak through which fuel is leaking out. Also check if the valve is working properly. 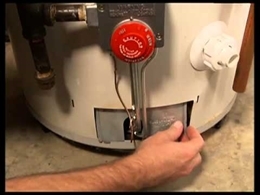 Inspect if the valve is wired properly to the thermostat that sends signals to it for heating. The valve should be widening to allow the release of fuel. As for leaks, you should watch out for a visible smell of gas. You can also take a mixture of soap and water and rub it on the pipe that conducts the fuel. If there are leaks, bubbles would appear on the surface of the pipe. Leaks need to be repaired ASAP to avoid potentially disastrous results. Sometimes ignition may not happen due to problem in ignition switch. This is the case usually in an electronic model with an automatic ignition for the pilot light. In such cases turn the furnace off from the breaker box. Wait for some time and then turn it on. Sometime doing so reset the machine. 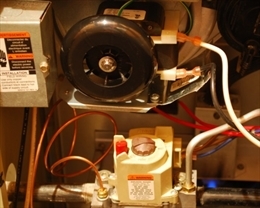 If the ignition does not spark back after machine is turned on, there is an electronic issue that needs to be diagnosed and repaired by a HVAC technician. Disclaimer: Although these are the typical methods used to troubleshoot a non-working pilot light in a furnace, they can vary from place. Please consult the professional service provider as the details are for information purposes.